A disorder in which a furrow or groove is seen on the vocal cord, running parallel to, and at or just below, the cord’s free margin. 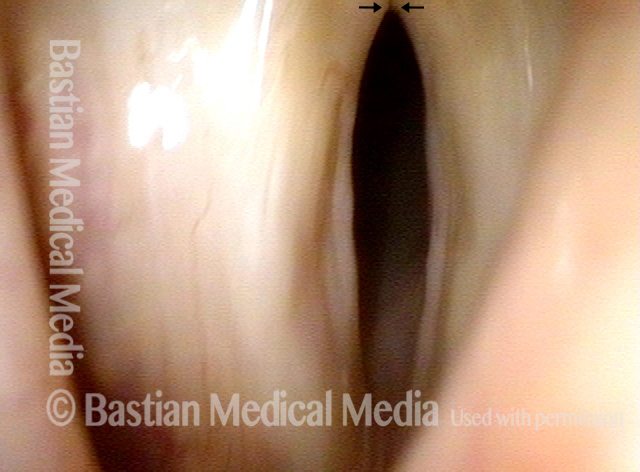 This glottic furrow normally represents a defect in the underlying vocal ligament. Often, the deepest part of the furrow is lined with epithelium that is attached directly to thinned vocal ligament. Pseudobowing (due to mucosal and ligament abnormality more than atrophic muscle) is also a common feature. A furrow is to be distinguished from a sulcus, which is more a defect within the mucosal layer only, and is thought to represent the empty sac of what was formerly a cyst. A furrow is typically shallow, and its lips are apart; a sulcus is usually deeper, and its lips are in contact and therefore harder to see. A furrow normally adheres to the vocal ligament, and the apex or deep surface of a sulcus often does as well. However, in the case of a sulcus, the vocal ligament itself is normal. Also, in the case of a furrow, the mucosal layer—often only an epithelial layer, in fact—will tend to adhere more broadly to the ligament, due to loss of the Reinke’s space layer of the mucosa. Congenital furrows, on both vocal cords, in a 14-year-old with lifelong husky, air-wasting voice. Seen here at a distance, under standard light, with cords in breathing position. The margin of each cord, especially that of the left cord (right of photo), has a "flattened" appearance. As the cords come nearly to phonatory position, notice the pseudo-bowing, and persistence of flattening or even "farmer's field" furrow. Phonation, open phase of vibration, under strobe light, shows large amplitude (lateral or outward excursions) and, at each line of arrows, an "edge" of mucosa. This edge is seen because the mucosa of the broad expanse of the free margin is closely adherent and cannot oscillate. At this patient’s most closed phase of vibration, under strobe light. 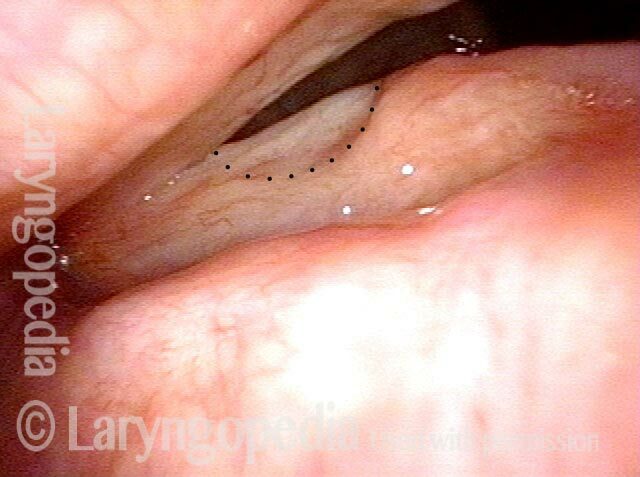 Note that the leading edge of non-adherent vocal cord mucosa (again indicated by arrows) has slid medially (compare with photo 3). 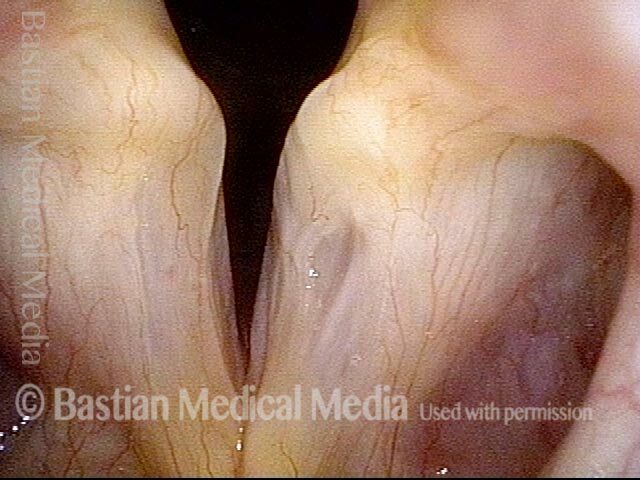 This patient has a glottic sulcus on the left vocal cord (right of image) and a glottic furrow on the right vocal cord. Same patient, inspiratory (breathing in) phonation. Note how this accentuates the opening of the sulcus on the left vocal cord (right of image). Same patient. Compare with photo 4 to observe the vibratory appearance of the sulcus and furrow. Same patient. Compare with photo 3 to observe the vibratory appearance of the sulcus and furrow. Standard light showing partially abducted cords. Here, the furrow on the right cord (left of photo) is seen best. Closer view, now showing the bilateral glottic furrows more clearly (indicated by the dotted lines). Under strobe light, closed phase of vibration. 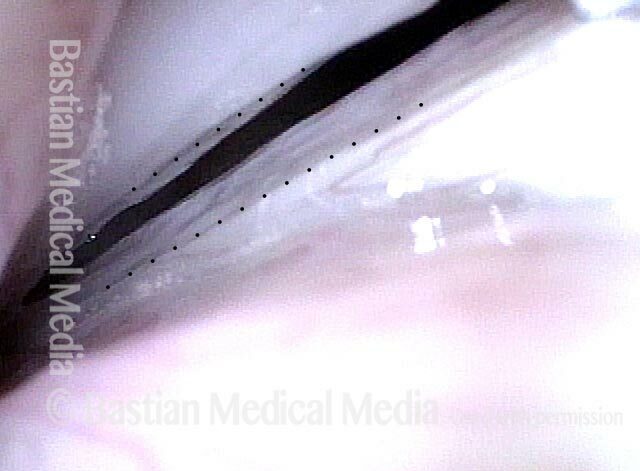 Focus on the right cord (left of photo), and note that the dotted line shows medial oscillatory position of mobile mucosa. The small elevation indicated by the large dot is a reference for comparison with next photo. Open phase of vibration. 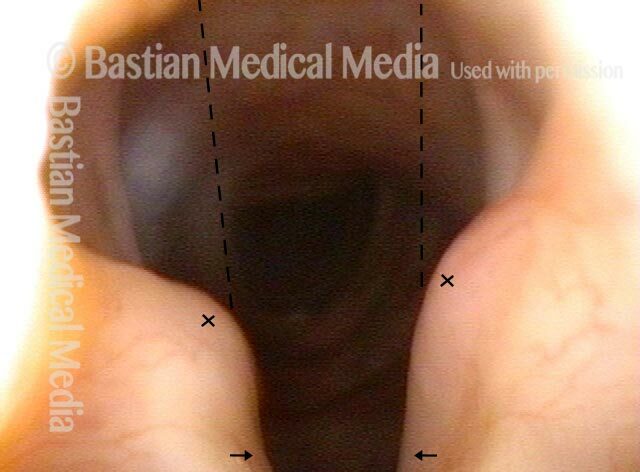 The mucosal wave is very far lateral on the upper surface of the vocal cord, indicated now by the curved dotted line. The small elevation has barely lateralized, consistent with the adherent stiff mucosa of the furrow itself. This man has performed intense popular music for many years, and has developed loss of strength and clarity of voice. Here, the tiny dots outline bilateral glottic furrows, where the epithelium is more closely adherent to the vocal ligament than it is elsewhere. This view under strobe light shows the right-sided furrow enclosed by tiny dots. At very high pitch under strobe light, vocal cord margins match well; the cause of this man's hoarseness is not a typical vibratory injury such as nodules or a polyp. Open phase of vibration, with only the lateral edge of the furrows marked with a dotted line. 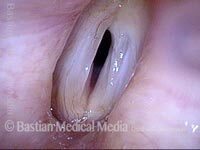 Part of the stretchy "cushion" of Reinke's space is lost and with it the mechanical de-coupling of mucosa from vocal ligament beneath. Huskiness in the context of the series title. Subtle "depressions" in the area outlined become more obvious in the following photos. As the vocal cords come slightly towards each other in preparation to make voice, the depressions are a little more evident. Here the depressed area is best seen at low pitch. At high pitch, the depression elongates and becomes shallower. This middle-aged man's voice has become increasingly husky and weak across many years. In retrospect, it was never a "strong" voice. The cords are bowed, and the furrows seen here (arrows) become more visible in subsequent photos. Under strobe light at B-flat 2 (117 Hz), this is the "closed" phase of vibration, perhaps better defined in this instance as the "most closed" phase. The open phase at the same pitch, shows a linear groove just below the margin of each cord. Some might call these glottic sulci, but "furrow" would be the better definition, as seen in the next photo. At lower pitch, the amplitude of vibration is larger and the right cord (left of photo) reveals more clearly that the the linear depression is a wide furrow, not a slit-like sulcus.